Lots has transpired since equity markets hit their lows the day before Christmas '18. Markets were panicked over a number of things: the shutdown of the federal government, mounting trade tensions with China, slowdowns in the Eurozone and Chinese economies, downward revisions to profit forecasts (e.g., Apple), the proximate return of trillion-dollar federal deficits, the path of monetary policy (e.g., the flatness of the yield curve), the plunge in oil prices (from $77/bbl in early October to $42 by Christmas), and the rise in credit spreads. Over the past two weeks these fears have lessened, but the market is still worried. The following charts (all of which include the most recent data available as of today) present a good overview of just where key economic indicators stand today. (My next post will feature key financial indicators.) 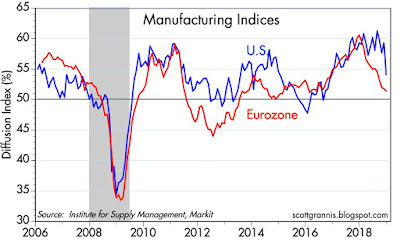 We're not out of the woods, since the indicators are not uniformly positive, but it remains the case, as I've said several times in recent months, that the U.S. economy's fundamentals remain healthy. The recent turmoil is thus more likely a panic attack than the beginnings of another recession. 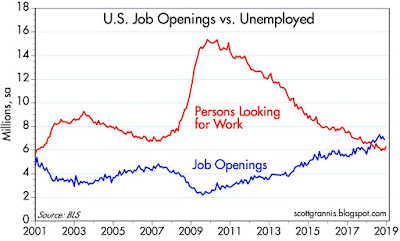 The labor market has rarely been so healthy, as suggested by Chart #1. 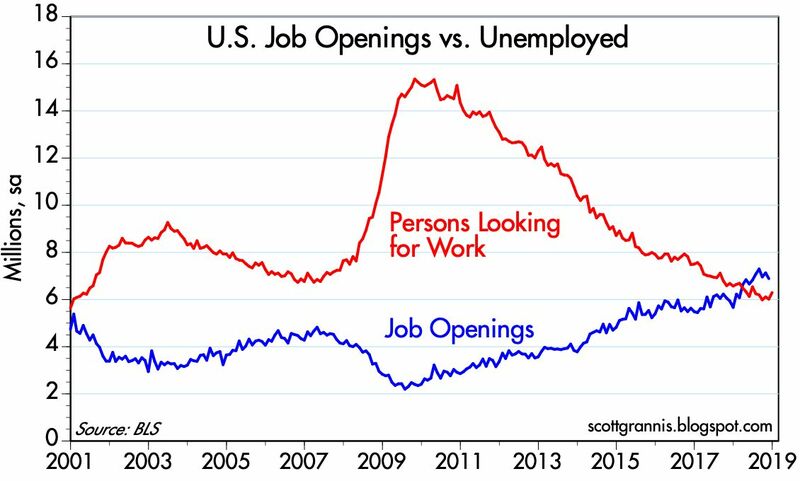 The number of job openings now exceeds the number of people looking for work! Today is arguably the best time to be looking for a job in generations. 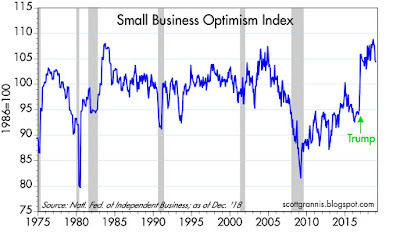 Small businesses employ the great majority of Americans, and small business owners are still very optimistic about the future (see Chart #2), despite the market turmoil of the past several months. 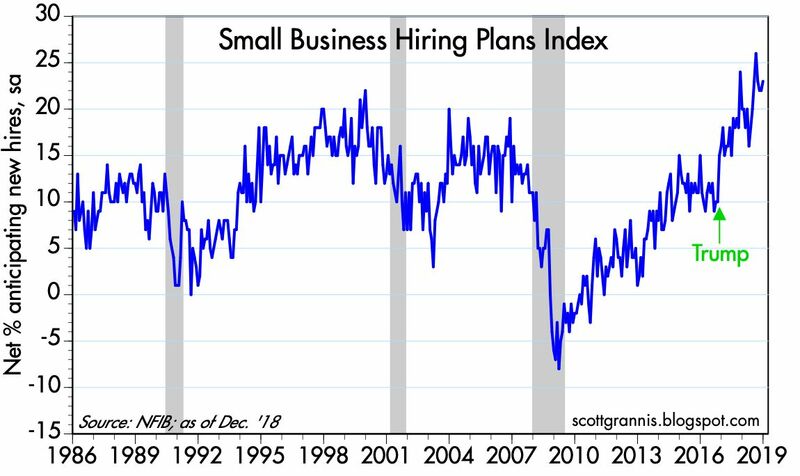 In fact, the biggest problem facing most small businesses is the difficulty in finding qualified people to fill their job openings. 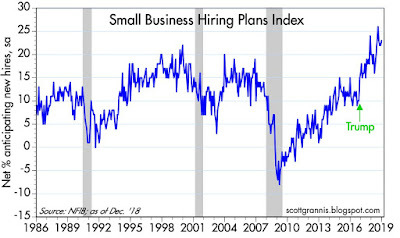 Hiring plans, as shown in Chart #3, remain very expansionary. Optimism among those capable of creating growth is very important. If we consider the less numerous number of manufacturing/industrial concerns (Chart #4), the ISM manufacturing survey reveals a disturbing drop in sentiment in December. 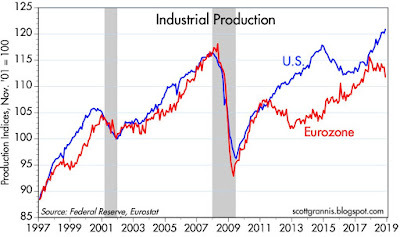 This unfortunately coincides with the weak numbers coming out of the Eurozone in recent months. Undoubtedly, the recent market turmoil has made corporate executives a bit circumspect in regards to the future. 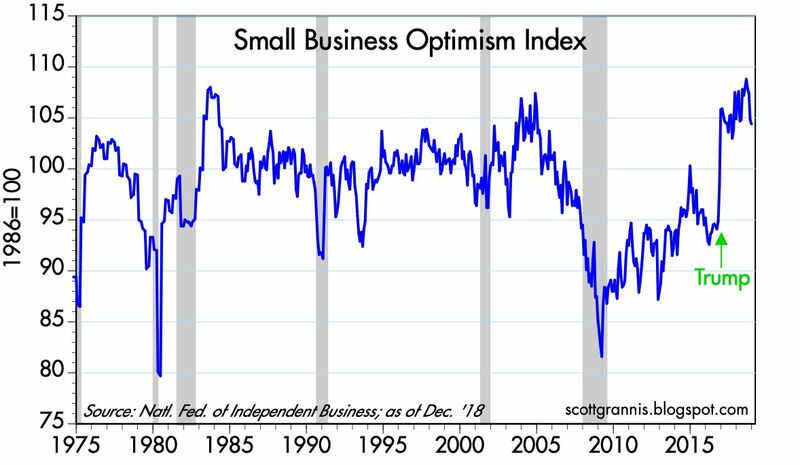 This doesn't necessarily mean we're on the verge of another recession however: these surveys have experienced several periods of weakness in prior years which were subsequently reversed without an intervening recession. Whatever the case, Chart #4 is probably the least optimistic chart in this collection. 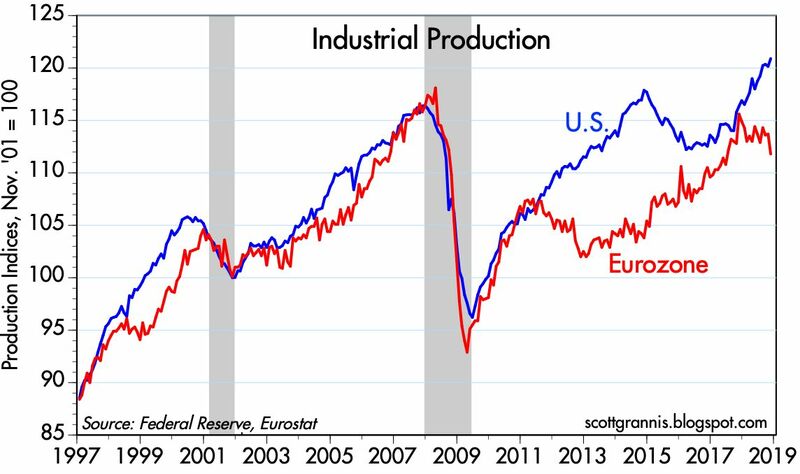 Nevertheless, and despite the weak ISM surveys, Chart #5 shows that industrial production in the US reached an all-time high last month, and it has made impressive strides since late 2016. The Eurozone, in contrast, has stalled and weakened on the margin, as uncertainty over the future of the EU, coupled with an oppressive tax and regulatory environment, has plagued sentiment and confidence. China has slowed down as well. Most data point to the Chinese economy growing at its slowest pace (4-5% or even less) in over two decades, and the stock market is down some 30% in the past year. For that matter, it is hard to name any country outside of the U.S. that is enjoying healthy growth. Does this mean the U.S. is doomed? Or does it just mean that conditions here are so favorable that we are likely to once again be the world's engine of growth in coming years? As an optimist, I'm inclined to the latter interpretation; in my experience it always usually pays to give the U.S. economy the benefit of the doubt. 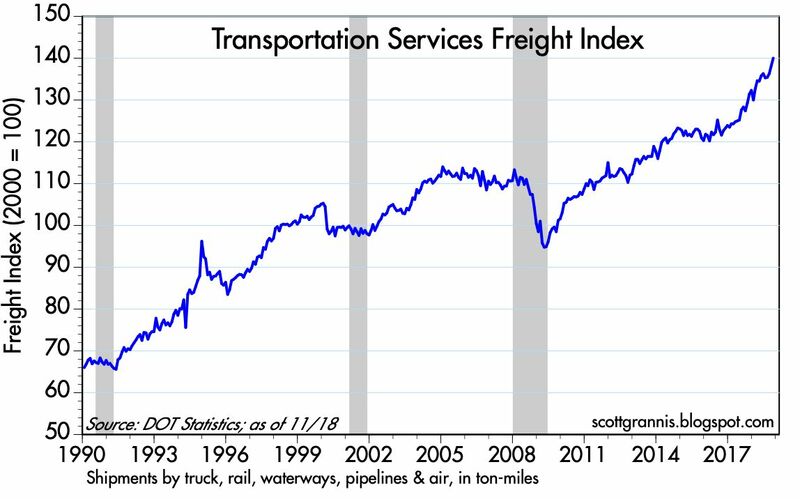 US freight shipments, shown in Chart #6, have surged over 14% since Trump's election. This is one of the most impressive signs I have seen that the US economy is growing at a healthy, and perhaps surprising pace. The rest of the world is having problems, but we are doing about as well as could be expected, to judge from this chart. 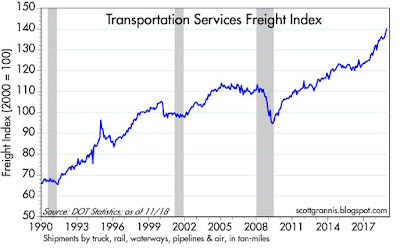 Chart #7 shows a subset of freight shipments—truck tonnage—which is also quite strong. But it also shows how the recent surge in physical activity in the US economy is at odds with the recent decline in equity prices. This could be a very good sign that the market selloff is due more to "panic" than to any actual or impending economic slump. 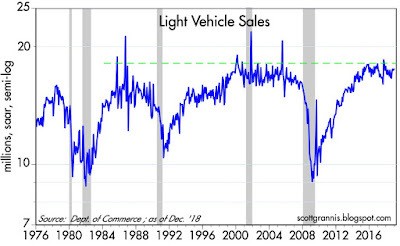 As Chart #8 shows, car sales in the US have been relatively flat for several years. 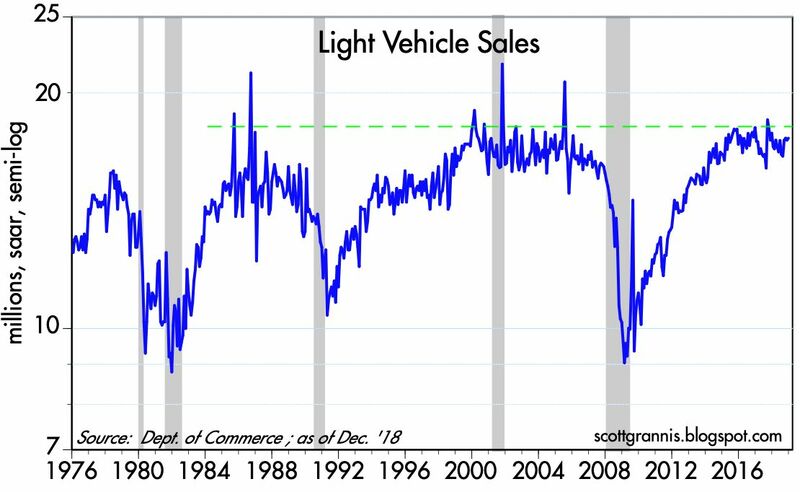 I had expected to see sales rise above previous record levels, if only to make up for the extensive and extended decline in sales that began in 2008 (i.e., years of very weak sales plus an aging fleet should have translated into above-average new car sales for at least a year or two). 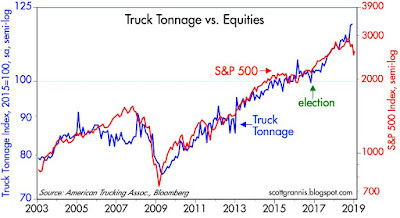 Regardless, flat car sales do not necessarily imply future economic weakness, and could simply reflect a pause. Bear in mind that jobs are growing at a healthy 2% pace, real incomes are rising, and the population continues to increase. 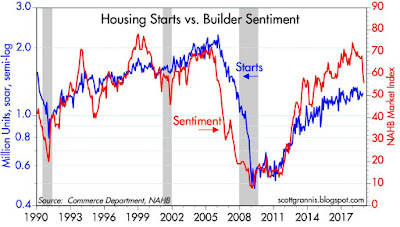 As is the case with car sales, housing starts have stalled in the past year or so. 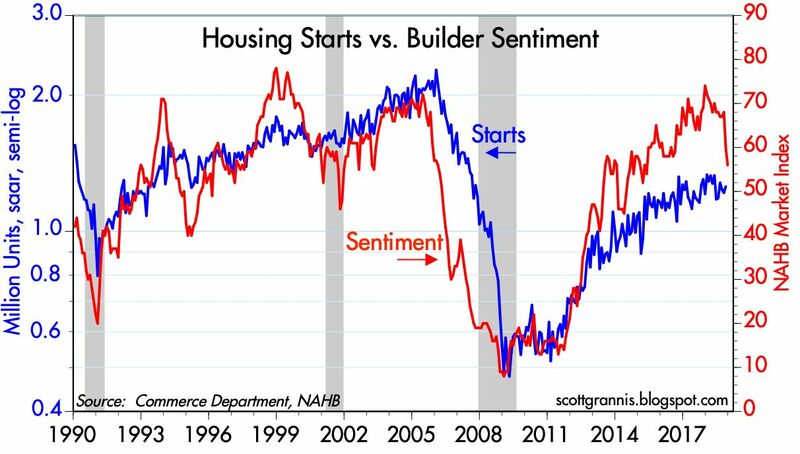 Furthermore, builder sentiment (the red line in Chart #9) has slumped of late. Does this portend the beginnings of another housing crash? I doubt it. I think it just reflects the fact that housing supply had run a bit ahead of demand, which began to be hurt by rising prices and rising mortgage rates. In other words, housing had become less affordable, a problem which is naturally solved by a combination of flat to lower prices, slower growth in new home construction, and a reduction in borrowing costs (mortgage rates have dropped almost half a point in the past several weeks). This all smacks of a market-driven adjustment process, not the beginnings of another housing crash. It's also important to note that in recent years the housing market has not been distorted by government mandates, unlike the boom of the early 2000s, when Congress forced banks to make un-sound loans which were subsequently purchased by Fannie Mae and Freddie Mac. 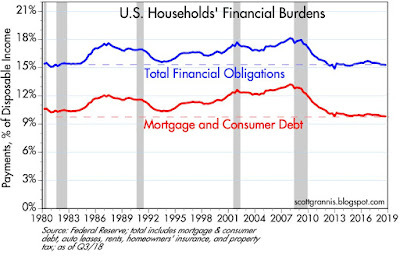 The Fed recently updated its estimates of household financial burdens, as shown in Chart #10. 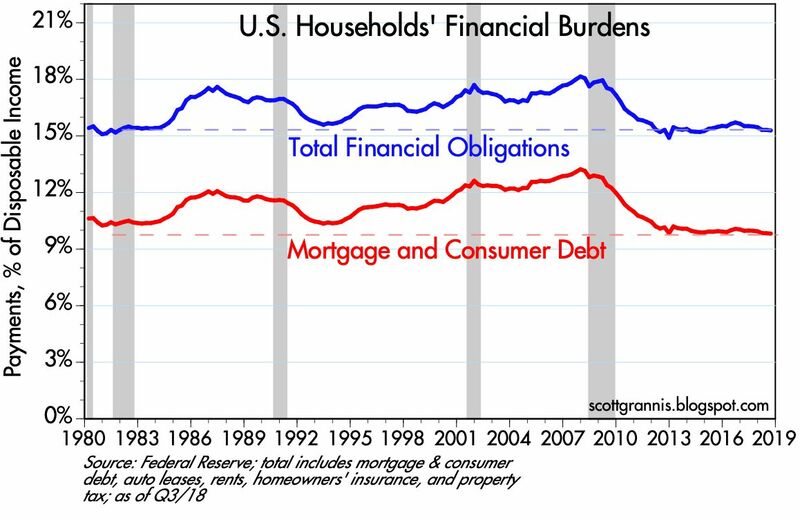 Here we see that financial obligations (monthly payments for mortgage debt, consumer debt, auto loans, rent, homeowners' insurance and property taxes) are about as low, relative to monthly disposable incomes, as they have been for many decades. Households have been unusually responsible in the management of their finances. This puts a very important sector of the economy on solid footing. The economic outlook is far from perfect, but there are numerous signs of strength and general health. Things would be better if there weren't so many headwinds. Regardless, at the very least the above observations are consistent with current Fed estimates of 2.5% GDP growth in the fourth quarter. 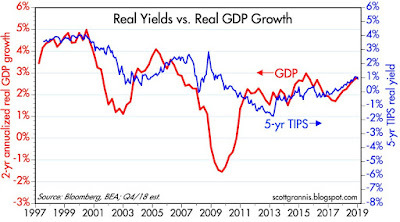 And it is reasonable to expect growth of at least as much in coming quarters, as Chart #11 suggests (i.e., the current 0.9% real yield on 5-yr TIPS is consistent with a real GDP growth trend of 2.5 - 3%). That's not gang-buster growth, but it's better than we've seen for most of the past 9 years. In my next post, due out shortly, I will review a number of key financial indicators: interest rates, spreads, volatility, the dollar, and commodity prices. Terrific macroeconomic wrap up. Hard to argue with charts 6 and 7. There's a whole lot of shaking going on. I love the tight job market and I hope they get tighter and wages higher for a long long long time. If you want to keep Ocasio-Cortez or Bernie Sanders out of the White House tight job markets are your best answer. 1. Does it include student loans? 2. Would it be possible to see the chart for disposable income itself? Thanks. Thank you scott. It would be interesting to see your comments on AAPL given recent developments. One reason I shun individual stocks is life cycle. Jeff Bezos recently said he expects AMZN to go out of business-at some point in the hopefully distant future. His point is that almost ALL businesses have a life cycle. Just look at GE, GM and even IBM. It's HARD to rediscover a huge business which is absolutely necessary for continues success (especially stock performance). I am NOT prognosticating AAPL's demise! Simply asking for Scott's perspective. Roy, re Chart #10: I believe this does include student loans, which currently total about $1.2 trillion and comprise about 30% of total consumer credit, which currently totals $4 trillion. For context, total household debt totals about $16 trillion, with $10.3 trillion of that being mortgage debt. Student loans are thus about 8% of household debt. steve, re AAPL: I think AAPL is "on sale" at current prices, as Warren Buffett would say. The market seems to be pricing in the fact that Apple's best days are behind it. In short, the market believes what you fear. I think Apple can do better. I too like charts 6 and 7. I still think your best chart is corporate after tax profits as a percent of GDP. The percentage is twice what it was during the booming Reagan years and inflation is about 1/3 or less of what it was then. What am I missing? That chart with corporate profits / GDP does seem to be the key one. On the one hand, how fabulous! On the other hand, it's not hard to see that directly related to inequality spread. Before getting attacked - I'm a conservative voter. Elizabeth Warren is downright scary. But I'm coming around to the notion that Republicans better start paying attention to something other than judges, tax cuts and immigration scares. That chart supports that maybe there ARE real problems with concentration of the wealth engine. Banking regulation, drug patent and distribution manipulation, accreditation for jobs, regulatory complexity, and Ben's favorite zoning restrictions are suspects. Back to the original point, perhaps the market is sensing that one way or another, corporate profits / GDP will be pressured politically. I hope it's the Republicans. Or face a "Green New Deal" from a bronx bartender. randy: Free markets can be (minimally) structured and regulated so as to deliver maximum profits, which in turn implies maximum efficiency of capital and maximum benefits to society via higher living standards. I wouldn't for a moment argue that this is the case here (there is room for LOTS of improvements), but surely the US economy is one of the world's most dynamic, efficient, and productive. However, asking free markets to minimize income or wealth inequality is a bridge too far. As a society we can assure that everyone has an equal opportunity to work and invest, but we cannot assure equality of results. Can't be done, and any attempts to do so will only mess things up. If politicians were to attempt to force more wealth equality (i.e., reduce wealth inequality) the results would without doubt be perverse and counter-productive. That's why socialism doesn't work. Tom: re corporate profits/GDP. I couldn't agree more. As you probably know, I've been featuring that chart for many years. The market seems to think that the ratio will have to mean-revert, but that doesn't necessarily have to be the case. Globalization plays a big role in that I believe: successful US corporations can now address a much larger market, thanks to globalization, so it's only logical that their profits should rise relative to the US economy. Apple is on mega sale. This is a great entry point if anyone missed out. I bought more and added to my bushel. Steve, would Coca Cola fit? WM, I didn't come up with this idea. It's a well known fact. Certainly there will be businesses that can weather the storm better than others. KO has a 15 yr acr of about 6.3% vs about 8% for the SP500. If you think about it, it's damn hard to reinvent yourself every 10-20 years or so. AAPL did it by "pivoting" from computers to i products brilliantly. MSFT has done it by embracing the cloud as has AMZN. Part of the beauty of capitalism is the encouragement of innovation and destruction. As an investor it's very hard to figure out when a business is peaking hence my preferred recommendation of investing in mid cap index funds. BTW, Warren Buffet has added virtually no alpha over the past 15 yrs Vs a large cap index value fund. Yes, I'm all in on equality of opportunity, not equality of outcome. To equate my comments to notions of socialism is misdirecting I think. The point I was making is that Republicans would be better off recognizing and addressing structural constraints on equality of opportunity. Not just for virtue signaling, although a little more egalitarian spirit would be a good thing. But because those constraints really do exist to debatable degree, and to the extent it reduces real competition, the worse off all of us are. And Republicans will be losing elections if we don't address things like this. Randy, completely agree with Scott on this one. For further reinforcement, read John Tamny on this subject. Any government intrusion in trying to make income more "equal" (classic left wing response to this issue) actually causes MORE discrepancy not less. The bottom 20% of income earners are seeing their incomes rise faster than any other quintile. African American unemployment is at almost all time lows. All under the MEANY PANTS GOP (Donald trump!) government. You will NEVER learn this from the left. They would prevaricate until their faces turned blue rather than admit that under DT the poorest are doing the best in decades and I would argue, considering how technology enhances our lives, ever. That said, to quote Newt Gingrich the left wants to "rule or ruin". Truer words were never spoken. Well, it's Scott's blog and I usually align with Steve's comments. But somehow I'm failing to make the point that there are pretty obvious anti-competitive regulatory and tax policies that amount to rent seeking that is contributing to out-sized corporate profits. As evidenced in this back and forth, Republicans don't even want to discuss it. A former Cato institute researcher does a better job than me in this book? One more comment, then I'll leave it. To the extent there are anti-competitive structural issues - tackling those is an opportunity for Republicans. We should be against anti-competitive stuff by principle. Just as important the issue can be used to demonstrate to the dis-affected, or those worried about inequality, that Republicans understand this is a critical issue for voters, and will take steps to tackle it. Tax cuts, immigration and judges are not going to grow the tent. A significant percentage of young people don't believe western capitalism is the best answer. To protect western capitalism, we need to guard against real and perceived abuses. will do that to Apple investors ! ... before a recession starts. civil war of the Dumbocrats versus President Trump. reminds me of school children having a food fight. Can we have prosperity with these angry "children"
of real final sales growth. That's an unusually large build up of inventories. includes some charts that may interest readers here. There's no question that capitalism is the most efficient way to organize an economy, but the winners in our booming capitalist economy must realize that we live in a democracy as well. And if the majority of Americans perceive, justifiably or not, a widening chasm of income inequality then the wealthy may very well have their assets voted away, hence the Ocasio-Cortez and DeBlasio effect. The answer is to provide a type of income and relieve the anxiety of the middle and lower classes by providing universal health care and perhaps higher education, while leaving the engine of capitalism untouched and vibrant. There are novel solutions to both in the technology age which have hardly been explored but that goes beyond this little missive. We don’t live the n a Democracy. The Founders did all they could to prevent one. We had much better...a Constitutional Republic. That won’t survive rampant lawlessness. Pelosi shuts down the State of the Union address without bothering to contact DHS, Google “algorithm” rigs Congressional election while internal memos celebrate and CEO perjured self in Congressional testimony, Judicial Watch finds 1.5 million fraudulent registered voters on L.A. County voter rolls, and economic half-wit AOC joins Maxine Idiot on the House Financial Services Committee. Just another day in the DEM loony bin. ENJOY!! What could go wrong?? NASDAQ up, while QQQ down. Hmmm. Let’s see if stocks can push on thru the assault. Stowbrod, I don't know the answer re health care but it sure as hell ISN'T universal government controlled and distributed care. Our government is pathetic as it is! About the only thing they get right is defense and it costs damn near $1T, surely we can protect our country for a fraction of this crazy amount-but I digress. The USA is responsible for a large share of research in pharma done by businesses that have an incentive make to $. Know how much Euro invests in medical research? Practically nothing! There is no incentive. My son is the director for bioinformatics at a Crispr firm in Cambridge and visits Europe on a regular basis. They rely on us for almost all research. IF his firm is successful in their endeavors, investors will have poured over $1B in their company and waited probably over a decade for a W. Super risky. Again I don't pretend to have the answer but I def know what is NOT the answer. If the crazies like Lizzie Warren take over and try to move to universal health the entire R&D of pharmaceutical area will implode. It's virtually impossible to imagine a collection of politicians smart enough to design a system that works better than free market capitalism. And it follows that there is virtually no way to redistribute the wealth generated by free market capitalism without disrupting that same engine of free market capitalism. And who are the luminaries currently proposing/discussing such magical fixes? Brilliant thinkers such as Maxine Waters, Bill de Blasio, AOC, Nancy Pelosi, Chuck Schumer, etc. It boggles the mind that there are rational people willing to entrust these foolish people with the power to radically "tinker" with the most powerful and dynamic economy the world has ever seen. Politicians love power, money, and prestige, and too many of them are willing to promise "free stuff" to the greedy rubes. In the end it is just legalized theft. I'm reminded of a famous line: "The problem with money and politics is not that there is too much money, it's that there is too much government for sale." I think this came from Chip Mellor. My favorite is Margaret Thatcher's line that "the problem with socialism is that you eventually run out of other people's money." Scott, the idea is not to turn the keys of government over to Maxine Waters and AOC but to preempt them. I agree with almost all the critical comments but am stuck with the reality of America's shifting demographics and intellectually bereft new generation. I am a physician who has served on several insurance company boards and run a medium size practice and know there are many structural flaws in the current system. A successful alternative would need to be implemented over a generation to allow the medical system to adjust and correctly allocate resources, Considering the meatheads that make up our political class, it will not be easy and perhaps impossible, but remember that every arch conservative I know loves their medicare card. I suggest that conservatives take a lead on this issue rather than appear to be carping at every solution, no matter how zany and extreme. Keep in mind that between medicare, medicaid and corporate plans we are close to Universal coverage already, this is not such a wild idea. there's only one thing in the world that is pleasurable redundantly, and it ain't reading this blog or the groupies, tho JBG photos comes close for redundantly revolting. this post is rehashed reshash of speckle . If you like scary stories - read this article. The democrats are taking these foolish children seriously. I'd rather Republicans not reject climate change and inequality anxiety with scroogeish jingoism. Or Dems are the only choice for the majority of voters that don't think it's a joke. 2.5-3% GDP growth ? But we were promised 4%+ for the next decade in return for the tax cuts. What happened ? Remember Kansas ? Let me guess - when the deficit grows the calls will be to cut spending, not rescind the tax cuts. AOC is right. System is rigged for the rich. Tax revenues are at all time highs...as always after tax rates are cut. That's because the tax and regulation cuts just gave us the best economic growth and wage growth in a decade. Average Americans haven't even filed their taxes yet to see their savings. The spending has gone thru the roof, which is why the deficit is growing. YES, OF COURSE spending should be cut. The government is too big and keeps GDP down...just look at Europe. Markets love government shutdowns and spending cuts. Meanwhile unemployment has steadily declined, but unemployment rates for the most marginalized citizens just declined to the lowest levels ever recorded in US history. Unemployment rates for Blacks, Hispanics, Teens, and those without High School diplomas all went to record lows. Meanwhile, gasoline prices have plummeted...also helping the poorest Americans the most. You have to ignore common sense and all data to claim the blue-collar Trump recovery is "rigged for the rich" while the poor are finally prospering better than EVER IN US HISTORY. AOC is an idiot, and so are her sycophants. Time for them to get 'woke'. She and her economically illiterate Commie sympathizers are immorally trying to derail the best prosperity EVER for poor people. Its either deranged, dishonest or both.